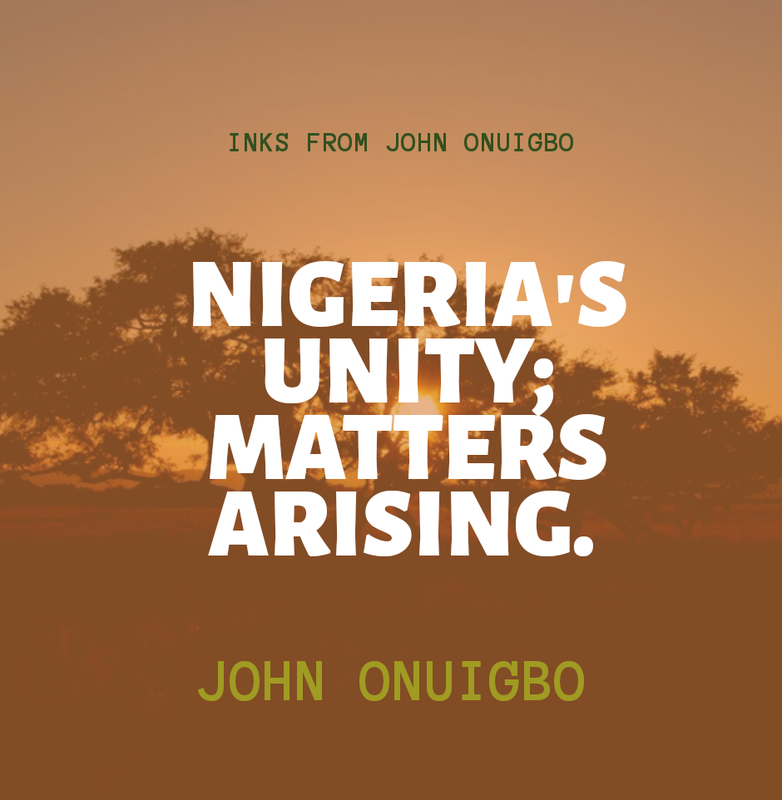 Home / Article / NIGERIA'S UNITY; MATTERS ARISING. All through my childhood, I had always seen the Nigerian coat of arms as a mere expression of Taiwo Akinkumi's talent in the arts. I used to cherish that eagle carefully placed on the black shield and those two horses? They were the funniest because they resembled my Trojan horse - a toy horse that I had cherished playing with so much. On a contrary note, as I grew older, seeing the coat of arms hanging helplessly on the wall of my classroom, I began to cherish something new. Something totally different from what I had cherished about the coat of arm in the past. It was the powerful inscription down there which always read "unity and faith, peace and progress". Permit me to run an analysis of that inscription. After thorough examination of those words, I noticed there was an inter relationship because " for there to be unity, peace must be present, and for progress to surface, there must be unity.Now, the big questions are, does our country follow this coherence or are we just chasing shadows? What are the factors jeopardizing the peace within? In the absence of unity, how can progress sprout up? All these questions are what this paper contends to answer after which I will present you a recipe for a special dish - a country where love, peace, unity and progress abounds. I just hope you'll feel great reaping from the abundance of my thoughts, carefully scribbled into paper by my blood flowing through the ink of my pen! Does our country follow the inter relationship in the words "peace, unity and progress" or are we just chasing shadows? I never knew when I posed this question in this article and that made answering it a great deal. In the course of answering this question, I asked my dad whom I expected would have a better knowledge of the Nigerian state, owing to his age and experiences ranging from the fact that he witnessed the civil war and so on. He replied " Son! This question is really one that requires a broad answer but let me try giving an abridged version. An African adage says that charity begins at home". He chuckled and again he continued, " the problem with our country is that we are always after the last word "progress", leaving behind the necessary steps that will lead to that which we run towards. Today, we have a Nigeria that's totally concerned about international relations rather than maintaining peace and calm in the country. Imagine a country where in the house of assembly, representatives sit according to their parties thereby providing different clusters as if the house is in shambles. A country that has witnessed the looting away of the mace which is the symbol of power in the legislature while the house was in session". I was in pains as he told me all these but contrary to my emotions, I saw him laughing. I asked, " is it really funny dad?". Just then, he continued. " A country where the house of assembly fought in the presence of secondary school students that came on excursion, over monetary issues". He asked, "what do you expect of those children when they grow up? We expect them to become great leaders? In fact, I will honestly tell you that Nigeria is only after the progress. As for the peace and unity part? None of the leaders care! Meanwhile, the truth is that the progress which we seek can never come in the absence of peace and unity. The due process must be followed ", dad concluded. "Then, what are those factors jeopardizing the peace within?" , I asked myself. As a youth in the Nigerian society, I can firmly say that the major factor mitigating unity and stability in Nigeria is bad leadership. Yes, bad leadership! The biblical injunction that when the righteous leads, the people rejoice but when the wicked comes into power, scorn and reproach leads the way still holds true. During the reign of president Goodluck Johnathan, we witnessed killings under the umbrella of "Boko Haram sect". This sect killed millions of people by bombing churches, markets et cetera. As if that wasn't enough, the abduction of chibok girls followed suit; the girls who were believed to have been abducted and led all the way to the Sambisa forest from where they were pushed into the world of trafficking. At that point, the 2015 presidential election was fast approaching. We fasted and prayed for a better leader; even if no other person did, I'm sure that my church did and I participated actively. At the end, it happened to be the man who promised us "change" that emerged as the winner. We were glad that at least, the Boko Haram sect would come to an abrupt end since that was among his numerous manifestos but what happened at last? We harvested desolate nights of bitterness. It was a modified version of incessant killings - the Fulani herdsmen menace. This time around, it was neither in the church nor in the market rather it was in our farms where we work under the scorching sun to make ends meet or in our homes when we retire for night rest. They laid ambush on us even in our own homes. They came to our doorsteps and with their sharp cutlasses, they massacred us in cold blood with our government sitting silent. Even when they massacred our people and priests in the church during prayers, our Government still didn't act up. As well, we silently watched those we voted for, to help us gain our rights eating our rights before us. They embezzled public funds like there was no tomorrow - they believed in sharing the national moi-moi rather than making it and what was the effect on us? We ran into recession and hunger dealt with us. Its really pitiful. Since they loot funds without giving us our rightful share, some of our Niger Delta brothers decided to vandalize pipelines, exploit oil and feed their pockets. What did this lead to? A mini war between the Niger delta militants and the Nigerian government. All these to the detriment of the 1914 amalgamation of the northern and southern protectorates for basic aim of unifying our country. The next question is, in the absence of peace, what is the fate of unity? The crest of activities of the indigenous people of Biafra (IPOB) which was; holding rallies and peaceful demonstrations asking for a referendum will be of great help in answering this question. We saw our Biafran youths asking for the declaration of the sovereign state of biafra with their leader, Nnamdi Kanu facing several arrests and delayed court trials. We also witnessed the "Operation python dance" in Abia state which was very bloody. Scores were shot dead, hundreds given dehumanizing punishments by the men of the military. In return, we witnessed the Arewa youths give Igbos residing in any northern part of the country an ultimatum to park to their home states before a given date ( 1st October, 2017). It was really a frightening Independence Day celebration. I ask, is this the state of living we envision for ourselves? A country in shackles and shambles? Little wonder, Professor Chinua Achebe said and I quote that "when things fall apart, the center cannot hold". This implies that in the absence of peace, there is no unity and in the absence of unity, there is no progress because Igwebuike - united we stand, divided we fall! What do you expect of a people that face all these problems rather than to love each other and tolerate each other. 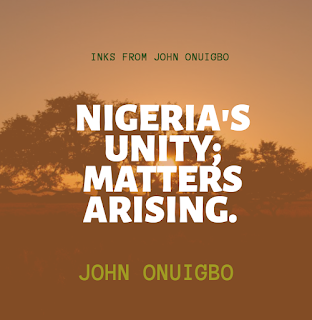 An important element of nation-building, especially for a complex and diverse country such as Nigeria is the existence of unifying national values and symbols that bring together diverse people under a single umbrella of a national identity. What do we see today? Our national values, aspirations and their accompanying symbols are progressively losing their meaning with the exception of assembly recitals by pupils early in the morning. The national anthem and pledge means little or nothing to many others, not to talk of the NYSC anthem which youths have remixed to form lyrics of mockery. Nigerians are increasingly becoming disdainful of and detached from the state and from each other. We are keen to emphasize on the differences between one church and the neighbouring mosque, rather than the poverty or unemployment that afflict us all. We should as well note that humans are social animals, therefore, they tend to live in communities and set each other’s company. Families live together even if they do not require any material benefit from one another. Conflicts occur between family members and sometimes lead to destruction. This is because of diversity. We all have different thoughts and ideologies. We should always bear in mind that we all belong to one race – the ‘Human Race’. God created the human minds, in different places, special structures, variant colours and unique identities. This is a way of telling us to embrace diversity but some people don’t understand it. Conclusively, in as much as I believe that achieving unity in Nigeria requires a collective effort, I still hold firm that it's more a personal effort. For a country in peace and unity, all religious bodies must know that they are all meant to serve as charters of peace and unity and not the reverse. As well, we must learn to appreciate the beauty in our diversity and make tolerance our chief virtue. It is a must to apply equality of status to everyone. A Hausa is not special than the Yoruba, nor the latter superior to the Igbo neither is a Christian more virtuous than a Muslim, not the latter to the traditionalist. It is as well important to create personal familiarity with other tribes and religions. When all these are done, I believe that then, our nation's motto; unity and faith, peace and progress becomes a reality and not a mere inscription and Niyi osundare's definition of Nigeria as "a mere contraption of people held together by the oil from the Niger delta" would be a mere fallacy because indeed all these problems we face are the things that made us imbibe the value of kindness, love and tolerance!